Lu has graced the catwalks of the top fashion houses around the globe. A powerhouse runway and print model, Lu was discovered by the Zoli modeling agency in New York. She began her career as a showroom model and quickly made a name for herself as the “go-to” model for the runways of Bob Mackie, Bill Blass Yves Saint Laurent, Oscar de la Renta, Givenchy, Patrick Kelly, Giorgio Armani, Escada, and Randolph Duke -just to name a few. She has been on covers and pages of top magazines and made numerous television and movie appearances. As a successful and sought-after model, Lu brings her expertise to the pageant world where she trains and coaches thousands of young ladies for Miss USA and the Miss Universe Pageants. 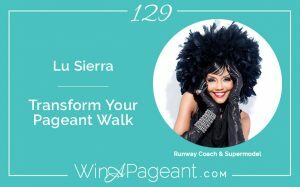 As a coach and runway expert, she teaches her technique on the runway, develops poise & presence, and continues to inspire those interested in the fashion and modeling world.